I suppose it's only fair to point out that this flight got off to a bad start. For one thing, it was significantly delayed by a late aircraft substitution and, to make matters worse, it left from one of the more hideous corners of the now much run-down Terminal 1. I felt it was a poor introduction to BA for my friend Bruce (a.k.a. sftrvlr), who was using the airline for the first time in many years. Thankfully, all that was to change the moment we stepped aboard. As we boarded through Door 2L and were escorted to our seats, I noticed immediately that the aircraft was fitted with Next Generation Club World, the latest incarnation of BA's long-haul Business Class product. I would not be sampling its merits on this flight, however, as we were bound for the First cabin. It did eventually occur to me that the new AVOD in-flight entertainment system would be a useful spin-off benefit in First. As I settled into 2A, I couldn't help noticing the occupant of 3A. I wandered over to 2K to check that Bruce was settling in OK and said "Is 3A who I think he is?" A quick check confirmed that we were indeed travelling in the company of a very famous, Nobel Peace Prize-winning, senior Anglican clergyman from South Africa! 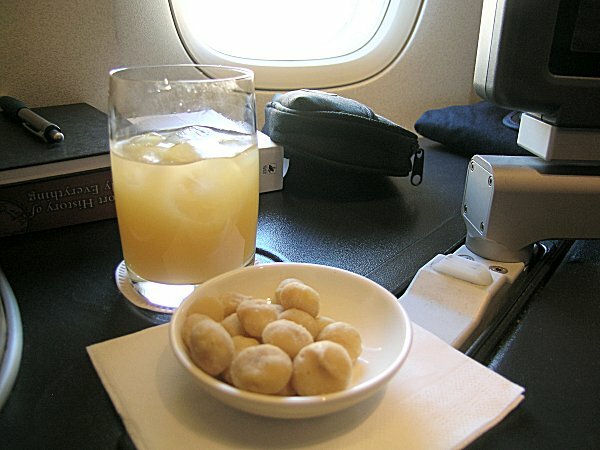 As I returned to my seat to enjoy a glass of apple juice and the customary macadamia nuts, my 'BAg' amenity kit, sleeper suit and slippers were all delivered. We eventually pushed back a full 1hr 20mins down at 2025 and, as we made our way round to 27L, I noticed that the safety video had been updated for NGCW. Soon enough, our 747-400 was lumbering down the runway, lifting into the evening sky at 2044. We were on our way at last! At the first opportunity, I changed into my sleeper suit. I missed my hot towel in the process, but in a very nice touch, the cabin crew brought one to me after the main 'run' through the cabin. By this time, I was enjoying some Champagne and canapés. The Champagne was copiously topped-up and I was already impressed by the highly attentive level of service. A big from 2K indicated that I was not alone in this The Cabin Service Director came round and introduced herself to the F passengers, coming over as both friendly and very professional. Soon it was time for the dinner service to get underway - having been asked for my preference on timing, I'd said sooner rather than later. I started with the duck and foie gras option, washed down with more of the Champagne. 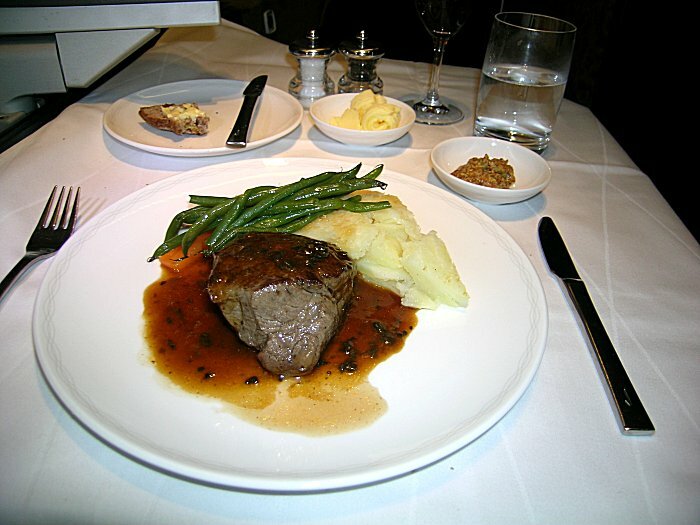 For the main course, I had the beef, switching to the South African red to accompany it. By the time I'd finished these, I decided that - regrettably - I was stuffed! I wished I hadn't snacked on those sandwiches back in the lounge, but I'm sure the advancing hour was also a factor. 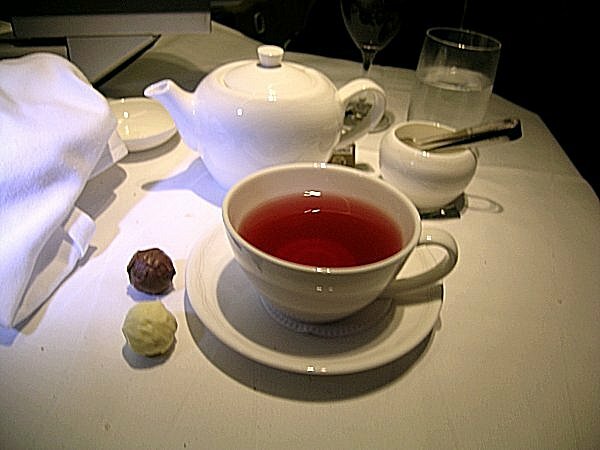 As such, I simply had a pot of blackcurrant tea to finish with, noting the attractive new china tea service - a very nice change from the old metal cans. I checked our route progress and found that we'd over-flown Paris before heading towards Milan, but then turned and passed west of Corsica and over Sardinia. We had already crossed the African coast at Tunis. I asked for my bed to be made up while I brushed my teeth, then settled down for what would hopefully be a good night's sleep. And it was, too : roughly six hours sleep. Not bad at all for on board a plane! For breakfast, I had a glass of apple juice and some Fruit and Fibre cereal. Unable to face a full English, I asked for some scrambled egg on toast with some bacon. I got what I wanted and it was absolutely delicious! I must say that they seem to have mastered the secret of scrambled egg in BA First - full of buttery goodness, not a hint of wateriness and just the right consistency I had two pots of Earl Grey, served - of course - in the nice new teapots. I nearly fell out of my seat when the Captain informed us that the ground temperature at Johannesburg was 3C Are you kidding me? Apparently not, as we were to find out soon enough. Appropriately enough, we touched down at Jumbo Time (7:47 ). However as it was on the airport's most distant runway, leaving us with other runways to be crossed, it was 0804 before we parked on our remote stand. A truly excellent flight, in no small part due to the excellent cabin crew, and one that I fervently hoped had impressed my discerning friend in 2K. I needn't have worried. The verdict? "Right up there with SQ." (Singapore Airlines) Result!